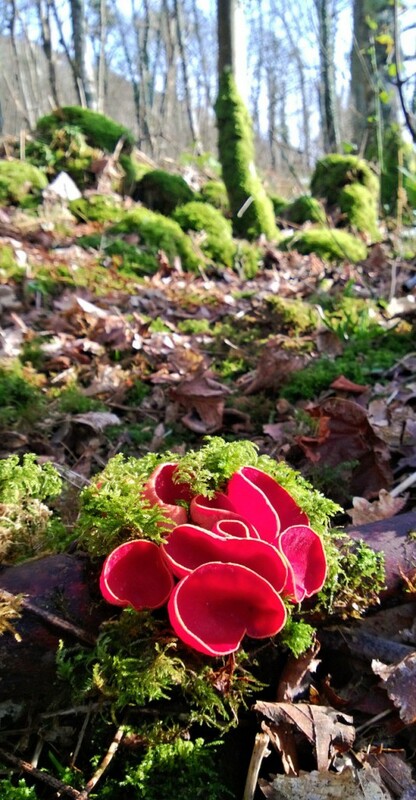 Both these species are variously referred to as scarlet or crimson elf cups. They are virtually indistinguishable to the naked eye. Edibility – 3/5 – Some guide books list them as inedible, perhaps because of their lack of succulence. I have heard one uncorroborated report from someone who read somewhere that they may not be especially good for you in large quantities, but have been unable to track down the reference. I rate them highly and am yet to encounter anyone who has had any issues eating them. 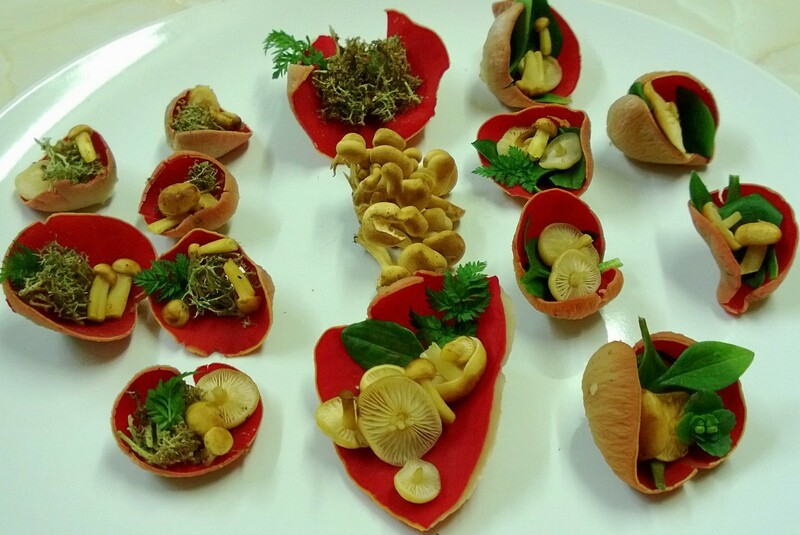 As with all wild fungi, eat only a small amount, cooked, the first time you try them. Habitat – Fairly common in humus rich, damp, deciduous woods with plenty of fallen wood, from which they grow. They have a preference for moss-covered ash, willow and elm, though identification of host trees can be tricky as they are usually in an advanced state of decay. They seem more common in the West and near the sea. I suspect this is to do with exposure to prevailing winds, which creates more windfall. These spectacular little fungi fall into the category of almost too pretty to pick. I find lots in a snowdrop and ramson-filled wood by the sea and the contrast of the red elf cups, white flowers and vibrant green moss makes it a very special place in February. I admired them for years without really bothering to try eating them – their thin red flesh put me in mind of chamois leather and didn’t seem to offer too much promise of flavour. So when a keen wild food chef I know started tweeting pictures of dishes using them and raving about them generally, I decided it was time to give them a go. Foraging is full of pleasant surprises, and elf cups are one of its best. They have a subtle, earthy flavour with perhaps a hint of beetroot. Though the texture isn’t typical of mushrooms, they do cook well – either frying or in stews seems best. They lend themselves so well to holding things, that I can’t resist filling them with other woodland gifts for some on-the-hoof raw hedgerow munching. I don’t usually recommend eating wild fungi raw, but haven’t encountered any problems with elf cups or young velvet shank (which taste like mushroom toffee!). If you do give it a go, try a little bit the first time. Early few-flowered garlic shoots, baby velvet shank, pink purslane and cep-infused lichen have all worked well and look, frankly, stunning. Scarlet elf cups are related to the equally attractive orange peel fungus which appears in the autumn usually on disturbed ground, new path edges etc. They look exactly as their name suggests, and I regularly pounce on actual orange peel by mistake! Elf cups can be found in large numbers in certain places when they are flushing, but even then I urge people to pick these beautiful fungi with restraint and leave plenty to continue to do their important work decomposing wood and for others to enjoy. Read more about responsible mushroom picking here. Those elf cup sushi ought to be on the menu at Noma! Brilliant. I must have a look through your articles and see if there’s anything else the mushroom books label “inedible” that are actually worth trying. Thanks Matthew. Have a look at the clouded agaric entry – they aren’t usually recommended but I have no problems with them. Lots more to come, bu never enough time! 20/05/2015 identified at Brandon Marsh Warwickshire scarlet elf cup fungi brilliant!!! Thank you for this article!!! I found some of these a few days ago but couldn’t find them in my edible wild mushrooms book so I assumed they were poisonous! I’m gonna head back out to the woods in a few and get some now thanks to your article! They ARE too pretty to pick and you’re ignoring the issues of other life forms that depend on the fungi you are destroying, and the beautiful sight that you are denying to other people who might want to view these. Basically it’s selfish and unnecessary. Please stop it. There’s little enough nature left as it is. I certainly don’t ignore issues around the complexity of nature. I’m more aware than most self-proclaimed “nature-lovers” of the fact that, until we learn to interact with nature in meaningful ways, rather than ring fencing it, it will always be at risk. Whenever I am challenged on this sort of thing, I ask the person asking to serious look at their own diet and its hidden consequences… monocultures, food miles, cataclysm-based farming practices… ALL (and I mean ALL) food has consequences elsewhere in the food chain. Some people like to pretend they are not a part of nature, and shield themselves from the wider impact of their diet. If you can let me know of any of “the issues of other life form that depend on the fungi” you claim I am “destroying”, then please share and I will alter my information. Please stick to science-based evidence if possible. I would draw your attention to the several scientific studies in the following link that shows no relationship between harvesting edible mushrooms and the health of the mycelium from which they grow. What you are suggesting is rather like asking me to stop picking crab apples from my local hedgerow, because you like looking at them and have some vague (but unspecified) notion, that other things might eat them. I’d like to say that I appreciate your concern deeply, There are not many People who actually care at all for nature,, and Science isn’t right about everything. At the end of the day this beautiful fungus has a role to play as both you and mark know. As mark says picking the fruiting bodies does not harm the mycelium growing in the wood,,, a little picking is good and encourages and spreads the spores further but over picking is not good because the fungus need to spore plenty. Also the spores are food for other microorganisms. But it’s also important as Mark said to get people connecting with nature. It would certainly sow seeds in people’s hearts to later respect it. But I believe in emphasising the need for respect and moderation. Thank you Jenny for bringing some common sense to this ‘frenzy’ (for that is what it is) of eating something wild just because it is ‘pretty’. And next in the article we see a huge frying pan full of these elf cups followed by a short sentence about picking these with restraint – yes Mark. Sure enough, this comments section now comprises mostly of comments from people who now plan to go out into the woods to ”try” these out … … and we can all guess how they will go about this task. 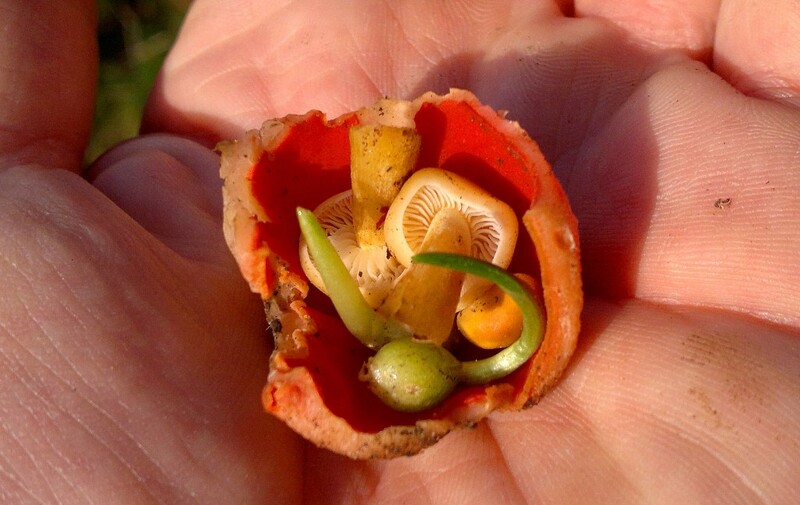 Yes, they will take a Tesco’s plastic carrier bag and fill it to the rim (or try to) with all they can find with anything they think ‘looks edible’ … and when they hit upon Scarlet Elf Cups, they will take the lot. Scarlet Elf Cups may be more plentiful in other parts of the UK, but here in East Anglia they are in very limited supply. Fungi contain a lot of water, so it goes without saying that other wildlife must eat fungi as part of their natural diet, and yes, the fungal mycelium will still be in the substrate continuing to do its vital work in re-cycling the dead wood upon which it is growing or rather, absorbing, and hopefully will produce more spectacular fruiting bodies next year. I use the word ”hopefully” for the very reason I am the person who re-discovered the extremely rare Candelabra Coral Fungus – this had not been seen in the UK for over 100 years and was thought to be extinct. I knew it was ‘special’ so removed a small frond to examine back home under the microscope and at the same time urged people present not to pick it because it may turn out to be very special. Back home, I discovered the sporeprint was white and got out all my reference books but because it was thought to be extinct in the UK I could find very little information – luckily, one of the countries finest field mycologists was leading a fungus course at Flatford Mill Field Studies Centre, so the following day I took my sample down to show him. “Candelabra Fungus” he immediately exclaimed, and within the minute he was on his phone to Kew to say “Candelabra Fungus … its been found” ! This sample is now preserved in the National Fungorium at Kew. In the meantime, I had to return to the site to take photographs, get a 10 figure grid reference, and get the land owner to protect the log pile upon which it was growing … all very well except IT HAD DISAPPEARED ! Me and the landowner spent many hours trying to re-locate this fungus but it was nowhere to be seen but almost certainly one of the members of the foray I was leading must have stayed behind and thinking the fungus was edible or looked so pretty, selfishly took all that was left – and despite my searching the wood intensely for the last 3 years, it has never appeared again. Please Mark … think carefully about what I have written and try to stick to the genuinely common fungi such as Velvet Shank and Oyster Fungi and leave others well alone. I’m not sure how you manage to equate 3 people over 4 years mentioning they will try eating this fungi to a “frenzy”? You appear to have ignored the comments by people who have learned about this beautiful fungi and expressed new admiration for fungi, with no mention of any interest in eating them. The information I have shared here is honest, clear and responsible, and allows people to make their own judgement about what they eat. If you have any scientific information that you can add to a constructive discussion, i’d love to read it, and will amend what I have written if new information becomes available. Even anecdotal information is helpfulThe only useful contribution is your observation that they are less common in East Anglia – thanks for that. Apart from the factual inaccuracy of this comment, it also demonstrates a very low opinion of your fellow nature lovers, who perhaps appreciate fungi in a slightly different way to you. Of course a few people do gather thoughtlessly (including a long history of botanical and mycological “collectors” with no interest in eating), but in my experience these are a tiny minority. The many hundreds of people I teach every year arrive with a love of nature and leave with a clearer understanding of how they relate to it, how to cherish and nurture it. Certainly nobody would leave one of my fungi walks so lacking in knowledge and appreciation that they would return to “loot” rare, inedible fungi! Fortunately, your low opinion of those who wish to connect with nature more intimately through their diet (by thoughtfully eating what is abundant around them and thereby reducing their overall impact on nature) is slowly dying out. “Look but don’t touch” attitudes to Fortress Conservation, while useful in occasional instances, are doing very little to make a positive change to the relationships between humans and the natural world – in fact for the most part they serve only to further alienate mankind from nature. More and more of my work is now with conservation organisations that are recognising the importance of foraging in safeguarding nature. Only last week, in partnership with Scottish Natural Heritage, I taught 20 outdoor educators about scarlet elf cups. At times, it was hard to put a foot down without treading on one. We cooked them with wild garlic – which is also abundant in SW Scotland. – I have eaten this fungi on a regular basis for 8 years – no ill effects. – Many thousands of people eat this fungi every year, with no ill effects. Its served in restaurants. – In some areas it is hyper-abundant, in others it is scarce or not present due to lack of suitable habitat. – Some year’s elf cups are hyper abundant near me, other years less so, but certainly no general decline in numbers. – Habitat loss (through loss of woodland, or misguided “tidying” of fallen timber) is the main threat to their abundance – not foraging. Oyster mushrooms are not common near me. So I’ll pass on your advice to eat more of them. I’m in Cumbria/Lancashire and these are SO abundant this year. I have no guilt taking a few. They are not actually something that one would eat huge amounts of. But foraging does teach one just how difficult it is to gather enough of anything to make a days meals…..makes one much more respectful of the farmers work. Glad you are enjoying them! I like to imagine just how much more foraging there would be (in terms of both uptake, volume and diversity) if modern farming and agribusinesses weren’t reducing our landscape to sterile strips of green monoculture, grown for silage, or uplands/forests decimated by sheep grazing. In general lamb and beef, are prestige but not practical foods, when you measure their true impact on the environment. I’m not sure where in East Anglia you live and forage….but I find scarlet elf cups to be fairly common in my area of east anglia…. If I could “like” Marks response to Jenny’s comment I would! Me too. I have one person in my hiking group has the same idea as Jenny, wonder they’re relative. Thanks so much for taking the time to post this information – I came across lots of these today on a woodland walk today in Wiltshire having never seen them before, and I was sure they must be inedible because of the beautiful scarlet colouring. Knowing they’re edible makes them even more fascinating! Thanks once again. My friend and I came across these beautiful items of nature today. We live in the United States…in Iowa…nowhere near the sea, so I feel our find is extra special! Thank you for this article! Nice one! Glad it helped. Elf cups alway feel special! My theory around them being more common around the coast is to do with more exposure = more wind = more fallen timber = more habitat, rather than any more specific maritime preference of the species itself. Tracey, I am sure you are correct and you have found what we here in the UK call Scarlet or Crimson Elf Cup, but if you are tempted to give them a nibble, please do so with extra caution because what looks to be the same in the States is not necessarily the same species we have in the UK. Here I am thinking about that very sad story of a Mother and daughter from Viet-Nam who moved to the USA and came across what they thought was the edible Paddy Straw Mushroom (Volvariella volvacea) which is very common in South East Asia. But in fact it was the identical and deadly poisonous Death Cap fungus (Amanita phalloides) the mother had found, and she told her daughter these are what she used to eat as a child back in Viet-Nam. The mother picked them and I believe made them into a soup. The daughter was more wary and only had a little. The mother died, but thankfully the daughter was saved. Do you know of any lookalikes in the US? I’m always keen to add to the information here. Edibility is a moveable feast! (Pun intended). Most notions of edibility are not scientific, but culturally defined. There are no clearly defined boundaries between what gets referred to as “poisonous”, “toxic”, “bad for your health” etc. Guide books will choose their own definitions according to the values and outlook of the authors and publishers. Most err strongly on the side of caution, often at the expense of accuracy. This is understandable, especially given the wide range of tolerances among individual, but it can be very confusing and pretty daunting for those trying to find what works as food for them. In terms of the specifics of elf cups, I believe there is some evidence somewhere that they aren’t especially good for you (I haven’t been able to track it down though – often this information spreads like chinese whispers from poorly researched sources), but as I make clear in the linked article, this is all about dosage and personal tolerances. I am not aware of any instances in which they have proven “poisonous” or “deadly” to anyone. While they may be uncommon in some habitats and areas on the edge of their range, I have seen no evidence to suggest they are in any way endangered or threatened with extinction. Again, perhaps a case of over-caution on the part of the author/publisher. Hi Mark, I hadn’t realized you had replied to my comment…thank you for taking the time. I’ve read your blog on the encounter with yew, it just shows how a moment’s distraction can be dangerous in many situations: driving, using machinery, foraging. I do wonder if our alertness is something else that is being lost as we live in this modern world where everything is checked for health and safety before it reaches us? Just out of interest, we are in Suffolk (East Anglia) and found large amounts of scarlet cups in two different locations…we didn’t go out looking for them, they were just where we happened to be visiting that weekend. If next year is the same, we will try them (one or two each…not by the carrier bag!! 😉 ). 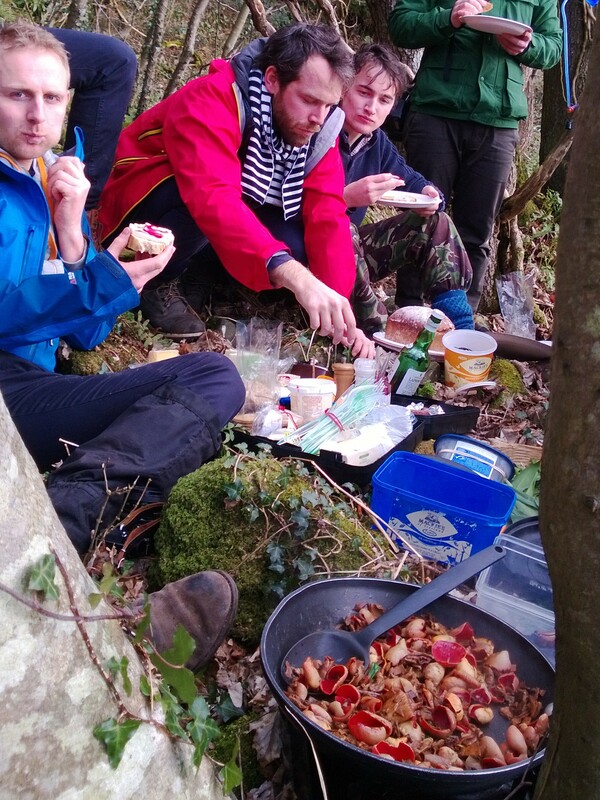 Most people we know who forage are also passionate about nature and volunteer on reserves, so take only a little and leave the rest for nature is common practice. I’ve overheard my children telling other kids only to take a few fruits from each plant, so good habits get passed on to their peers too. Found these growing happily in Parkin Wood north of Sheffield today. We were particularly taken with how line of them grew on a rotting branch covered in moss, just as you described. Lovely colour. Thank you for the information. Living in Southeastern Wisconsin, USA, we have these everywhere! I just noticed them while looking for morels. I will try a couple of them just to see how they taste. Do just saute them up in butter? I have noticed that what some people think are choice mushrooms, others do not like. Pheasant backs, aka Dryad’s saddle, mushrooms are one example. I do not like them at all, but some people love them. The same with giant puffballs. I even prefer gem studded puffballs over morels! Once again, thank you for the great website! 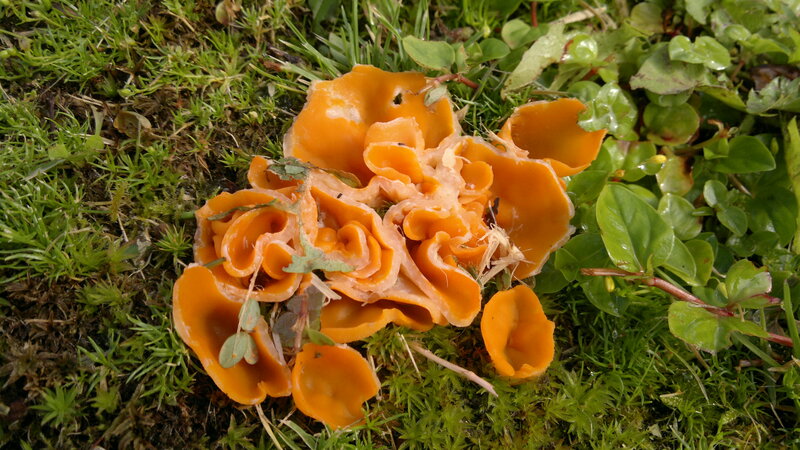 One more comment: The French page above discusses various cup mushrooms, and interestingly the salad/recipe suggestions are intened for the oragne variant Aleuria aurantia (which is not the scarlet elf cup). Concerning S.coccinea (scarlet elf cup) the page says “not edible” without additional explanation. Although I am a mycologist and adore finding fungi, I actually eat every few. And I am aware of a number of toxic or potentially toxic ascos (like these, in the large sense), so I was a bit wary. This question about eating these red elf cups just came up on FB, and I was in the “Why would you?” camp. But when I looked this species up on the U.N. F.A.O. document on Wild and Edible Fungi around the world, I found that not only are these considered to be edible, but that they are actually sold in markets, at some places! And frankly, your recipe looks rather delicious. So, carry on. You appear to be well aware of the harm of wanton over-harvesting, and you bring knowlege to many people, in a fun and accessible way. Yes, it is good to have concern for nature, and hunt mindfully or even just enjoy nature as an observer, but it is also super fun to find your own food, just like our ancestors used to do. Don’t take all that you see, walk lightly, and everyone and everything should be just fine.